I love your mitts! Actually, I love all your scarf patterns, too. I'm a realtively new knitter, still specializing in rectangles, but would love to branch out into mitts. 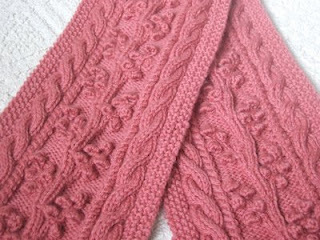 It would be wonderful to have some more mitt patterns that would cooordinate with your scarves! These are beautiful! I think there would be a LOT of interest in this lovely pattern. Very pretty! I think they look great on and off. Nice knitting! Crap, it ate my first comment. I'll bet if you wore them to Stitches West, people would stop you. I'll bet you 5 bucks, right now. Absolutely lovely! I've never been a "bobble" person, but these are very classy looking. Baby Cashmere is a great yarn. I second Bets! They are lovely. They are beautiful. I think the term you want is "thumb gusset". They are so very beautiful !! Thanks for sharing the pattern with us. 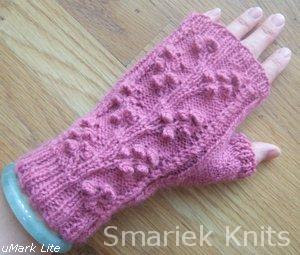 I'm a wristwarmer freak and I'm enjoying to knit your mitts ! 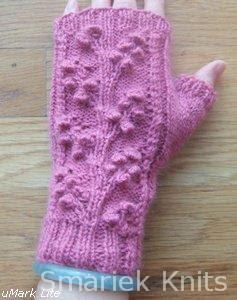 These are gorgeous and thank ou SO MUCH for sharing the pattern. I couldn't get to the patter through the box.net link though- have you made it downloadable from ravely.com perchance? Judy: I don't have your contact info. 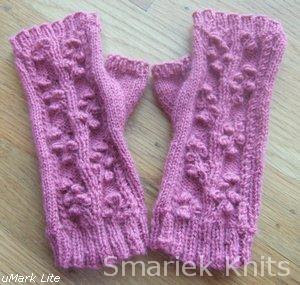 Please email me at smariekknits@gmail.com and I will email the PDF pattern file to you. thank you so much for sharing this pattern! 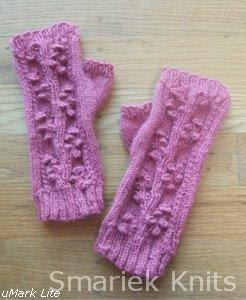 these are the most gorgeous arm-warmers i've come across, yet!